Construction for VA Butler’s new Health Care Center (HCC) is complete, and an official Ribbon Cutting Ceremony was held on Tuesday, August 29, 2017 to mark the occasion. The new facility, officially called the Abie Abraham Department of Veterans Affairs Health Care Center, will open for Veterans on September 5, 2017. The HCC is named after WWII hero, Bataan Death March survivor, and former POW Sergeant Major Abie Abraham. Abraham volunteered at VA Butler Healthcare for 23 years, spending 36,851 hours caring for fellow Veterans. 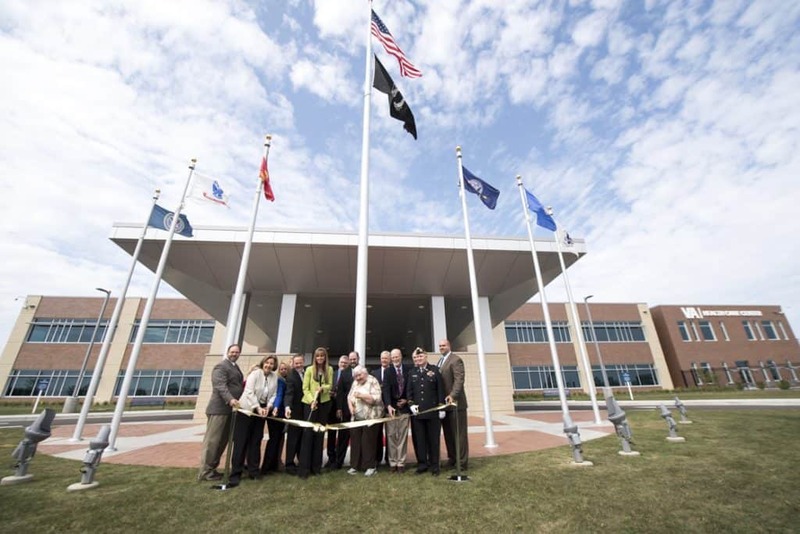 The Ribbon Cutting Ceremony included remarks from VA Leadership and Cambridge Healthcare Solutions PA, LP, and the keynote address was provided by U.S. Representative Mike Kelly. Additionally, former Pittsburgh Steeler and longtime friend of Abraham, Rocky Bleier, provided a special tribute to Abraham as the new facility sign was officially unveiled. The new HCC located at: 353 North Duffy Road, Butler, PA 16001 includes primary care, specialty care, mental health, dental, diagnostic, laboratory, pathology, radiology, podiatry, optometry, pharmacy, physical rehabilitation, and women’s health. It is a two-story building with 168,000 square feet, and more than 1,300 parking spaces. It is also silver LEED (Leadership in Energy and Environmental Design) certified. VA will lease the HCC facility from Cambridge Healthcare Solutions PA, LP (Cambridge), of Vienna, Virginia for a 20-year term. VA Butler Healthcare, located in Butler County, Pennsylvania has been attending to Veteran’s total care since 1947. We are the health care choice for over 22,000 Veterans throughout Western Pennsylvania and parts of Ohio and are a member of VA Healthcare VISN 4 under the U.S. Department of Veterans Affairs. VA Butler provides comprehensive Veteran care including primary, specialty and mental health care. We proudly serve America’s Veterans at our main campus as well as at our five Primary Care VA Outpatient Clinics in Armstrong, Southern Butler County (Cranberry Township), Clarion, Lawrence and Mercer Counties.